Today marks the 100th anniversary since Kiffin Rockwell was shot down and killed, that great American hero who volunteered to fight the Germans for freedom. 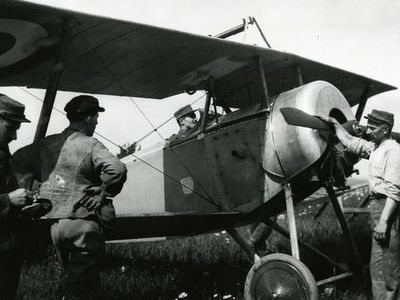 Kiffin Rockwell prepares to take to the skies of France in his fighter plane. A former Asheville resident, Rockwell, 24, was killed during a dogfight on Sept. 23, 1916. I've been seriously considering going to his grave in Luxeuil-les-bains to pay him tribute on this historical day. But it's a six hour drive and I just don't have the time nor the spare money right now. Feel kind of guilty. Do you think that I'm being sacrilegious? What would Kiffin think? At least I can give him tribute on the day in my mind long distance. When I was a kid World War I seemed pretty long ago, but back then it was only 50 years previously. Now it's a whole century! How much longer will people still remember these fallen heroes? What will happen to us when we die? Read the article: World War I aviator Kiffin Yates Rockwell may well be a bigger hero in France than here at home.